CoP members heard from Resource Futures Director Jane Stephenson – and then had a chance to pick her brain about peer network business models! In this blog, she outlines how different networks can sustain themselves and their members’ needs. 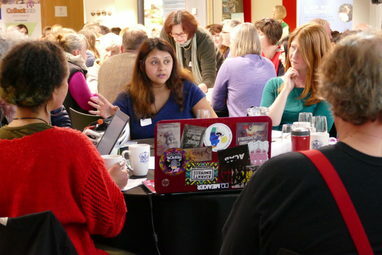 From local authority-funded Community Action Groups to partner-supported Bristol Green Capital Partnership, Jane runs us through the various ways a network can earn its living. Last week I spent an inspiring afternoon at Triodos’ Annual Meeting listening how they connect the world of finance with social and environmental initiatives and the launch of their new personal current account. Triodos’ investors and customers are part of a network who want to change banking practices. A reminder of the power of networks. But how do we make sure these powerful networks have all the resources they need? Networks, just like businesses, not-for-profits and enterprises, need business models. Recently I was invited to address the Peer Networks Community of Practice. There I reflected on the different network business models I have been involved in at Resource Futures. Here are four examples of network business models. These networks draw funds from a variety of services: public funding, private sponsorship, selling services or certifications… Read on and be inspired by these brief case studies! 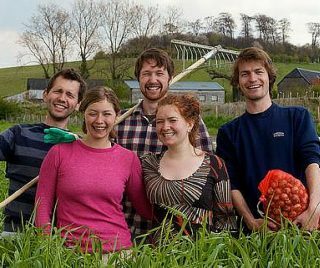 The Community Action Groups developed in Bristol in the 1990s model which is currently successfully deployed in Oxfordshire and now Devon to further local sustainable initiatives. Our staff provide infrastructure support, mentoring, advice and facilitate peer to peer learning – creating effective partnerships across geographic areas. CAG, working with Oxfordshire and Leicestershire Councils, has developed a model to measure the impact of groups’ social and environmental impacts. Currently CAG is local authority funded but we are actively looking for alternative business models with our Council partners in Oxfordshire. Community RePaint has been successfully developed since 1992 as a partnership with Dulux Paints (AkzoNobel) and Resource -ensuring that unused paint is redistributed to a network of over 70 schemes supporting communities and households in need. This work has led AkzoNobel to invest further in circular economy business thinking most recently in paint remanufacture. In Bristol, a vibrant and creative city, leading organisations have come together to support the Bristol Green Capital Partnership with funding and strategic support. These founding partners include Resource Futures, Sustrans, Centre for Sustainable Energy, Avon Wildlife Trust alongside Bristol City Council, the universities of Bristol and the West of England, Triodos Bank and the Bristol Initiative. BCorps is a new network in the UK of businesses committed to social and environmental purpose as well as profits. The certification is “to business what Fair Trade certification is to coffee or LEED certification is to green building.” Businesses certified by B Lab meet rigorous standards of social and environmental performance, accountability and transparency. What all these networks share is a passion for working collaboratively and making a positive impact. Each of tthese initiatives were started by a few people who were prepared to challenge existing paradigms. Together we can make change happen.